KUALA LUMPUR: YTL Corp Bhd will embark on restructuring its RM8bil real estate investment trust (REIT) and its hotel portfolio. This will rationalise the group’s retail and hotel asset portfolios by repositioning Starhill REIT as a global hospitality REIT. It will involve the disposal of its two retail properties, Starhill Gallery and its parcels in Lot 10 to YTL Starhill Global REIT in Singapore. “This will be followed by the injection of new hotel assets to put Starhill REIT on the path towards becoming a full-fledged international hospitality REIT,” said YTL Corporation in statement yesterday. The disposal consideration for the retail properties is RM1.03bil that was determined based on independent valuations. 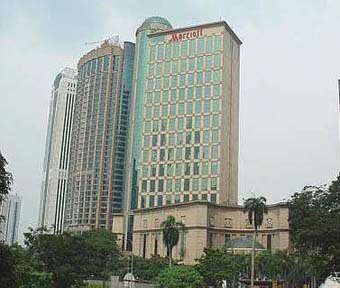 YTL Corp said after the proposed disposal, Starhill REIT would be well-positioned as a global hospitality REIT with two assets under its portfolio, namely the J.W. Marriott Hotel as well as 60 units of service apartments, four levels of commercial podiums and two levels of car parks at The Residences at the Ritz Carlton in Kuala Lumpur. YTL Corp managing director Tan Sri Francis Yeoh Sock Ping said this exercise would restructure the RM8bil in retail and hotel assets under its control into two distinct REIT portfolios, namely the hospitality REIT in Malaysia and retail-centric REIT in Singapore. “This will benefit both REITs in terms of pursuing growth and development strategies in terms in a single and focused class of assets. “On the completion of the rationalisation, Starhill REIT in Malaysia will be transformed into a pure-play vehicle for hotel and hospitality-related assets,” said Yeoh, who is also the chief executive officer of Pintar Projek Sdn Bhd, which manages Starhill REIT. Yeoh said hotel assets with the potential to be injected into Starhill REIT would include Pangkor Laut, Tanjong Jara and Cameron Highland resorts, Ritz-Carlton Kuala Lumpur and the remaining part of The Residences, among others. “From a global standpoint, we see potential for Starhill REIT to acquire high-end assets in key-international hot-spots in Bali, Saint Tropez and Phuket,” he said. Meanwhile, Yeoh said Starhill Global REIT had embarked on the acquisition of David Jones Building in Perth, Australia. YTL Corp Bhd plans to streamline RM8 billion worth of hotels and retail malls it controls in Asia-Pacific into two specialised real estate investment trusts (REITs) in Singapore and Malaysia. Starhill REIT, listed on Bursa Malaysia, will ultimately own only the hotels under the YTL group, while the Singapore-listed Starhill Global REIT will focus on retail malls when the revamp is completed in six months. The move makes it easier for analysts to rate the stocks and investors will be clearer about the property trusts' intention when they expand globally. YTL Corp managing director Tan Sri Francis Yeoh made it clear during a media briefing in Kuala Lumpur yesterday that the two REITs are set to grow internationally with an Asia-centric strategy. Among others, Starhill REIT may buy more brands in the hotel and hospitality sector. "This is the time to buy more brands because the world has not fully recovered yet. There are still low hanging fruits to be plucked," Yeoh said. As part of the revamp, Starhill REIT will sell the two shopping malls in its portfolio - Starhill Gallery and Lot 10, both located in downtown Kuala Lumpur - to Starhill Global REIT for RM1.03 billion. This will leave it with JW Marriot Hotel Kuala Lumpur and part of The Residences at The Ritz-Carlton serviced apartments, also in Kuala Lumpur, worth a combined RM400 million. Subsequently, Starhill REIT will use the proceeds from selling the malls to buy other Malaysian hotels under the YTL group, which will boost the asset size to RM1.6 billion. It can also take on more debt for this since its current debt-to-assets ratio is only 13 per cent. These assets are the remaining 54 apartments in The Residences, luxury hotel The Ritz-Carlton Kuala Lumpur, Pangkor Laut Resort in Perak, Tanjung Jara Resort in Terengganu, Cameron Highlands Resort, The Majestic Malacca, and the three Vistana Hotels in Kuala Lumpur, Penang and Kuantan. Potential assets to be sold into Starhill REIT in future include The Chedi Phuket, SPA Village Resort Tembok Bali and the Muse Hotel in Saint Tropez, France, which is under construction. Yeoh pledged that the dividend yield of Starhill REIT will stay at least 7 per cent after the group's asset restructuring. There is also a plan for the REIT to pay out dividends every quarter as part of a bigger plan that allows YTL Corp to get steadier returns from its subsidiaries. YTL currently owns 65.2 per cent of the REIT in Malaysia and 28.9 per cent of the one in Singapore. Starhill Global REIT's assets include retail malls in Singapore's famous Orchard Road and Tokyo's Roppongi area, and it is set to buy another mall in Perth, Australia, to bring the portfolio to S$2.5 billion (RM6 billion). 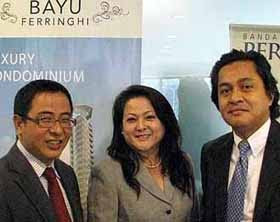 KUALA LUMPUR: Property developer Plenitude Bhd plans to launch six new projects in its current financial year ending June 30, 2010, said executive chairman Elsie Chua. “The new developments will be in the Klang Valley, Johor Baru and Sungai Petani with a gross development value (GDV) of about RM280mil, consisting mixed developments,” she said yesterday after the company’s AGM. From left: Tan Seng Chye, Elsie Chua and Plenitude Bhd director Zukarnine Shah at the company AGM on Wednesday. Chua said the company’s Taman Desa Tebrau project in Johor Baru would be among the new developments, where 55 units of bungalows with a GDV of about RM55mil would be launched probably by the end of this year. Plenitude has also planned for the development of 248 units of double storey houses in Taman Putra Prima in Puchong, scheduled to be launched in March next year. “Apart from the new launches, we are also focusing on our ongoing projects such as developing double-storey semi-Ds at Lot 88 and affordable terraced houses at Bandar Perdana in Sungai Petani, Kedah. We are also focusing on our luxury semi-Ds and a resort-style high rise condominium at Batu Feringhi in Penang,” she said. Chua added that although Plenitude had embarked on more “exciting” projects, it would still focus on building affordable homes. Meanwhile, executive director Tan Seng Chye said Plenitude would be interested in developing an office tower in the Klang Valley if it could find the land for it, adding that it was also open about expanding its landbank in other areas. “Our focus will continue to be in Johor Baru, the Klang Valley and Penang. However, if we managed to find some other viable places, then we may go for them,” he said, noting that Plenitude currently had more than 1,800 acres of strategic development land. Property developer Plenitude Bhd said it wants to build office towers if it can buy strategic land, namely in Kuala Lumpur's commercial centre. "Yes, we are considering that (to build office towers)," executive director Tan Seng Chye told pressmen after the company annual general meeting in Kuala Lumpur yesterday. Plenitude, which typically builds affordable houses, has set up a business development team to do this. Tan said Plenitude's present land areas are mainly for residential developments and are not in locations where office blocks can be built. "But if we find a piece of land in the Kuala Lumpur commercial centre then we will build office towers," he added. Plenitude aims to add more acreage to its 404.7ha land area with focus mainly in Johor, Penang and the Klang Valley. 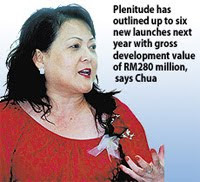 Meanwhile, executive chairman Chua Elsie said Plenitude has outlined up to six new launches next year with a total gross development value (GDV) of RM280 million for the year to June 30, 2010. The new projects include the first ever bungalow development in Taman Desa Tebrau, Johor, and on going projects at Taman Putra Prima, Selangor, as well as Lot 88 and Bandar Perdana in Sungai Petani, Kedah. Taman Desa Tebrau township's first bungalow development includes 55 units of 21/2-storey bungalows in Phase 12B, with a GDV of RM55 million. "We have another 212.8ha of undeveloped land in the township that has been earmarked mainly for terrace houses," she said. In March next year, the company plans to launch 248 units of 2-storey, 22 x 65ft terraced houses in Phase 8B of Taman Putra Prima, says Chua. The development has a GDV of RM80.95 million. Taman Putra Prima still has some 89ha of undevelo-ped land. Next year, it plans to launch double-storey terrace houses and semi-detached units in Lot 88 in Kedah. Meanwhile, group general manager for sales and marketing Khaw Hock Seang said Plenitude is re-planning its Bandar Perdana project in Kedah. "We are planning to put in a newer product mix into the development," said Khaw, adding that double storey semidees as well gated and guarded units could be in the offering. Financial services and property development group TA Enterprise Bhd (TAE) expects to acquire another hotel by next month, said its group managing director and chief executive officer Datin Alicia Tiah. The planned acquisition comes on the heels of a RM636 million deal to buy over Singapore's Quayside Gem Ltd, which owns the Swissotel Merchant Court in the republic, which is slated to be concluded by the end of this month. "There will be another hotel acquisition before the end of this year," said Tiah at the company's extraordinary general meeting in Kuala Lumpur yesterday. The four-star 476-room Swissotel is the fourth property purchase by TAE in the past 12 months. From December last year to September, TAE paid almost RM515 million to buy properties in Canada, Australia and Malaysia. Tiah said TAE will spend S$5 million (RM12.15 million) over the next five years to upgrade Swissotel, without disruptions to its hotel operations or bottom line. She added that the hotel will also be transferred to its property arm TA Global Bhd, which is en route to a listing on the Main Market of Bursa Malaysia on November 23. 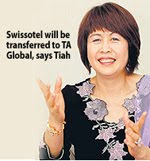 "We will transfer Swissotel to TA Global for cash or in exchange of TA Global shares, after the listing," Tiah said. TAE has folded all its property assets, including Aava Whistler, Westin Melbourne and Radisson Plaza into TA Global prior to the prospectus launch. On the return on investment on the asset acquisition, Tiah said TAE bought Swissotel with a yield of 7.6 per cent. "There is guaranteed ebitda (earnings before interest depreciation taxes and amortisation) of S$19 million (RM46.17 million) over the next four years. I believe Singapore will recover and room rates will move upwards next year. These will enhance earnings," Tiah said. Last year, Swissotel made a net operating profit of S$20 million (RM48.6 million) on revenue of S$53 million (RM128.8 million), with an average occupancy of 78 per cent. Tiah said the hotel acquisition is expected to bring synergistic benefits to the TA group as it will further enhance TAE's hospitality operations in major cities around the world and increase the company's existing portfolio of hospitality properties. KUALA LUMPUR: TA Enterprise Bhd expects earnings from its hotel operations to triple next year following the completion this month of the acquisition of its fourth hotel, the Swissotel Merchant Court Singapore. “There will be four hotels contributing to the segment from Nov 30 onwards and we are positive,” managing director and chief executive officer Datin Alicia Tiah said after the company EGM yesterday. Sales from hotel operations totalled RM76.6mil, or about 14% of the group’s sales, for the financial year ended Jan 31, 2009, the company’s 2009 annual report showed. The group, via its property division TA Global Bhd, already owns three other hotels - the Westin Melbourne, Radisson Plaza Hotel Sydney and the Aava Whistler Hotel in Canada. TA Enterprise, which saw its share price rise more than 50% this year before softening, has consolidated all of its property assets under TA Global and the company will be listed on Bursa Malaysia on Monday. The four-star hotel had an average occupancy rate of 78.5% last year, she said, adding that the proposed purchase came with a S$19mil earnings before interest, taxes, depreciation and amortisation (ebitda) guarantee for the years 2010 to 2013. The ebitda guarantee is secured against a cash deposit of S$10mil held by the escrow agent, i.e. a party that has fiduciary responsibilities in the transfer of property from one party to another. Future plans for Swissotel include an estimated capital expenditure of about S$5mil budgeted for the next five years for refurbishment and upgrade activities, Tiah said. The budgeted capex has been taken into consideration in the pricing of the hotel. GEORGE TOWN: The state government has imposed hefty increases in the rates for property development and change of land use in a bid to increase its revenue. The charge for the enhancement of land value has been increased from 25% to 50% for the island and a charge of 12% introduced for the mainland, Chief Minister Lim Guan Eng announced today. Previously, there was no charge for the enhancement of value for land under the Seberang Perai Municipal Council’s (MPSP) jurisdiction. Besides that, the development charges for housing have been increased 300% from RM5 to RM15 per sq ft and commercial development projects from RM7 to RM21 per sq ft.
For the transfer of the right of development to another party, the state government has now fixed the fees at triple the development charges and twice the building plan fees. There is also a new fee for rezoning. In justifying the increases, Lim said the increase in revenue would enable the state government to carry out other beneficial projects for Penangites, including helping the lower-income group. Speaking at a workshop on enhancing the real-estate development process, Lim said the state government had simplified many processes to ease matters related to real-estate development. “In return, you [developers] should also assist the state government as we need to raise the rates to do more for Penangites,” Lim said. However, he said that for developers who achieve the gold standard on the green-building index, the old development charges of RM5 for housing projects and RM7 for commercial projects would remain applicable. Lim said that despite the global economic downturn, many approvals for planning permission were given out, but not many of these projects actually took off. “In 2008, 216 commencement-of-work permits were issued for building plans with a gross development value of RM1.13 billion while this year, until September, permits were given for 151 projects with a GDV of RM934.63 million,” Lim added. The Minister of Finance Inc (MOF) has offered Syarikat Perumahan Negara Bhd (SPNB) some RM100 million to settle part of monies owed to contractors, according to sources. The national housing company owes between RM250 million and RM300 million to 35 Class A Bumiputera contractors hired to develop 35 projects across the country, involving 35,583 low-cost and affordable units. A source told Business Times that SPNB will have to look for its own funds or loans to pay the contractors the remaining sum. A task force, headed by the MOF, has been set up to look into the matter as the contractors have not been paid for the houses built since late last year. "There is an oversupply. SPNB had overlaunched the projects when demand was low. It is unable to pay the contractors as sales are not moving. People are not buying because the houses are in rural areas, far from basic infrastructure," the source said. It is understood that SPNB's management, headed by new managing director Kamarul Rashdan Salleh, is re-strategising the company's business model. "SPNB will guarantee that the 35 projects will go on. It will work out a plan to resolve the issue amicably," the source said. In addition, SPNB has received some RM200 million from the government to build houses across the country under the affordable housing and "Rumah Mesra Rakyat" programmes. The latter is for families with a household income of RM1,500 and who have land on which SPNB can build them a house. The landowners can take loans from SPNB with minimal monthly payments. The government will also subsidise one-third of the construction cost. OLYMPIA Industries Bhd, through its wholly owned subsidiary KL Landmark Sdn Bhd has sold all of its 188 units of K Residence condominium, generating gross sales of RM483.3 million last year. Foreign investors made up about half of the buyers of the 50-storey condominium, it said in a statement to Bursa Malaysia. KUALA LUMPUR: Ahmad Zaki Resources Bhd has secured a project from the Public Works Department worth RM309.4mil to build a complex along Jalan Sultan Salahuddin, Kuala Lumpur. In a statement to Bursa Malaysia yesterday, Ahmad Zaki said the works were to be completed from Dec 1, 2009 to May 28, 2012. It added that the project was expected to contribute positively to the group’s earnings and the net tangible assets for the financial years ending 2009 to 2012. KUALA LUMPUR: TRC Synergy Bhd’s subsidiary TRC Land (Cambodia) Ltd is acquiring a 26% stake in a Cambodian construction and property development company, Delta Garden Ltd, for US$1.95mil. In a filing with Bursa Malaysia yesterday, TRC said it had signed a sale shares contract with Liv Sopheaktra, for the transaction. It said Delta was currently constructing 123 residential units and a club house in Phnom Penh. TRC said it considered the investment strategic as there was a healthy demand for quality homes in Phnom Penh and Delta had a substantial land bank. It added that it was confident of securing construction contracts there, given its extensive experience in public works construction, major civil engineering works and property development.